A change in manager failed to yield a turnaround in fortunes for Tottenham, as two goals from West Ham in the final 10 minutes saw Tim Sherwood’s interim reign end with a 2-1 defeat in their Capital One Cup quarterfinal at White Hart Lane. One of the results that had played a part in Andre Villas-Boas’s fate being sealed on Sunday had been a 3-0 home defeat to West Ham in October. And it was a similar scenario this time around, with Tottenham controlling large periods of the match, but ultimately being caught cold by Sam Allardyce’s side. This time the home side did get the opening goal when Emanuel Adebayor capped his first start of the season by volleying in midway through the second half. 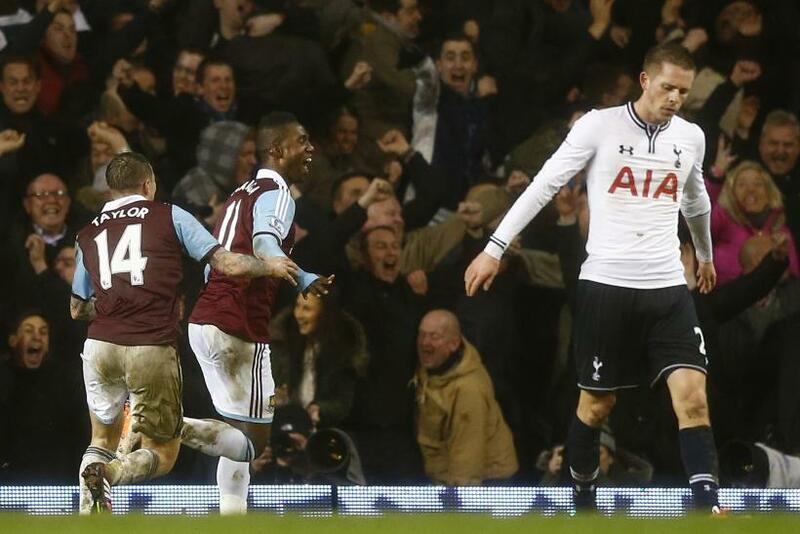 But late goals from Matt Jarvis and then substitute Modibo Maiga dramatically sent West Ham into the last four. It was hardly the result Sherwood would have wanted as he looks to show that he has the credentials to lead the side on a permanent basis. Prior to kickoff, the club’s head of football development had been the favorite with several bookmakers to get the job. The former Tottenham midfielder had made his presence felt in his first team selection by reverting to a two-man frontline, featuring Jermain Defoe and the previously frozen out Adebayor, while he played two wingers, Aaron Lennon and Andros Townsend, on their natural sides. His side enjoyed a positive start. Indeed, all that was missing from a dominant opening spell was a goal as Townsend fired wide, Joey O’Brien almost headed into his own net and Defoe shot over. In contrast to Villas-Boas, Sherwood was a constant, vocal presence on the touchline, but he almost found his side behind in bizarre circumstances. James Collins aimed to return the ball to Hugo Lloris after an injury stoppage, but his long punt from his own half had the Spurs goalkeeper frantically back-peddling before reaching to just keep the ball out of his net. In the 67th minute Sherwood could celebrate. Breaking from a West Ham corner, Defoe was sent clear down the left before picking out a fine cross that his strike partner volleyed emphatically high into the net from eight yards out. But rather than go on to close out the win, Tottenham were soon struck by a double blow. First, Maiga flicked on a long clearance by West Ham goalkeeper Adrian and Matthew Taylor fed a smart ball across the box to allow Jarvis to run onto it and hammer a shot past Lloris at his near post. Things went from bad to worse five minutes later. From Mohamed Diame’s out-swinging cross, the much-maligned Maiga rose highest in the center of the box to power a header into the net and secure a result that may go some way to ensuring that Allardyce is not the next Premier League manager to follow in Villas-Boas’s footsteps.